Blackening is a cooking technique made famous by New Orleans chef Paul Prudhomme by which meat or fish is cooked in a cast-iron skillet that's been heated until almost red hot. 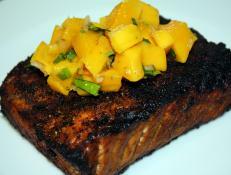 Prudhomme's original specialty was blackened redfish. The food is customarily rubbed with a cajun spice mixture before being cooked. The extra-hot skillet combined with the seasoning rub gives food an extra-crispy crust.